Black nylon waterproof cable to chassis connector. Fastens and waterproofs cables from 1/8" through 5/16" in diameter. Mounts into a 5/8" diameter hole. Includes rubber washer. 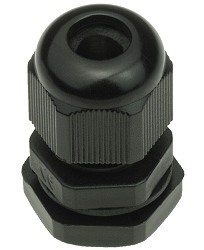 This chassis connectors squeezes a round rubber grip around the cable as you tighten the top nut to permanently secure and waterproof it.